We’ve all done it: you’re getting ready to leave the house and you realize you’ve forgotten to charge your phone. Its battery level is perilously low, but you have 15 minutes to spare, so you plug it into its charger to give the battery a boost – and it gains a measly two percent. How do you avoid this in the future? Read our guide on how to charge your Android battery faster. Battery life is a combination of many different factors, so there’s no single solution to rule them all, but if you use your smartphone intelligently and have the right equipment, all these good practices can add up to save you a ton of frustration with your battery. Check out all our top tips below. 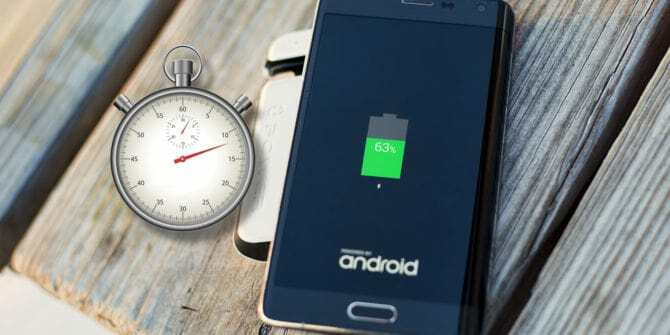 Many modern Android phones support fast charging, which delivers a whopping 15-18 watts and can, therefore, charge your phone much more quickly. You’ll find a good list of fast charging phones on the Qualcomm website (you don’t need to have a Qualcomm processor; just Qualcomm’s power system). Be aware that just because a phone supports fast charging, it doesn’t mean the charger that came with it is a fast charger, or the most effective charger possible for that phone. You may have to buy your own. For example, the LG G6 came with a stock charger that used Quick Charge 2.0, just like the G5, even though both phones support Quick Charge 3.0. We also don’t recommend using wireless charging if you’re in a hurry. Wireless charging can’t deliver power as well or as quickly as good old-fashioned cables, so it’s best used when you have more time on your hands. The exception to this rule is wireless quick charging. This will be more effective than USB charging, but less effective than cable charging from a wall socket. If you can avoid getting your battery too warm, it’ll reward you with a slightly faster charge. This won’t actually charge your phone faster, but it will solve the problem of having a low battery and not enough time to fully charge it. Portable USB chargers come in small, lightweight packages and often can be picked up for less than $20. Carry one of these in your pocket and you can charge your phone on-the-go – meaning you don’t have to worry about that last minute dash to pump some juice into it.